Each week this post covers situations where social media has had a powerful impact on, or, created a hullabaloo about, a brand or societal issue. If you’re a regular reader, you’ll know that last week I hit a wall of negativity and railed, or I confess ranted, against the inanity that appears to dominate the social networks. That post touched a nerve with quite a few people who were just as up in arms about the fact that the ‘crisis’ of Ben Affleck as Batman appeared to get more play than the story of over 1000 people dying from gas attacks in Syria. A few heavy users of social media whom I admire told me to pick my line of vision up a bit and focus on the good. Jennifer Windrum founded Sock Monkeys Against Cancer (SMAC) after her mother was diagnosed with lung cancer. Tangible Support – Always: Provide constant comfort, sock monkey “mojo” and a cancer-crushing companion to those wading through their cancer journey. Giving: My ultimate business model goal – One SMAC! = Two. When you buy a SMAC! monkey, one will be given to someone impacted by cancer (model to be executed once the company can financially sustain it). Create Social Change: By helping and giving to those impacted by cancer, you will also be contributing to advances in cancer research and programs (also once the company can financially sustain it). With the determination shown by Jennifer, I’m sure SMAC would have been a success in pre-social media days, but social media really became the engine that drove SMAC’s success. Danny Brown has always been ahead of the curve in Social Media, and his 12for12K cause was no different way back in 2009 when he founded it to raise $12,000 monthly for 12 different charities. The cause started with zero funds; Danny paid for the website and hosting himself. 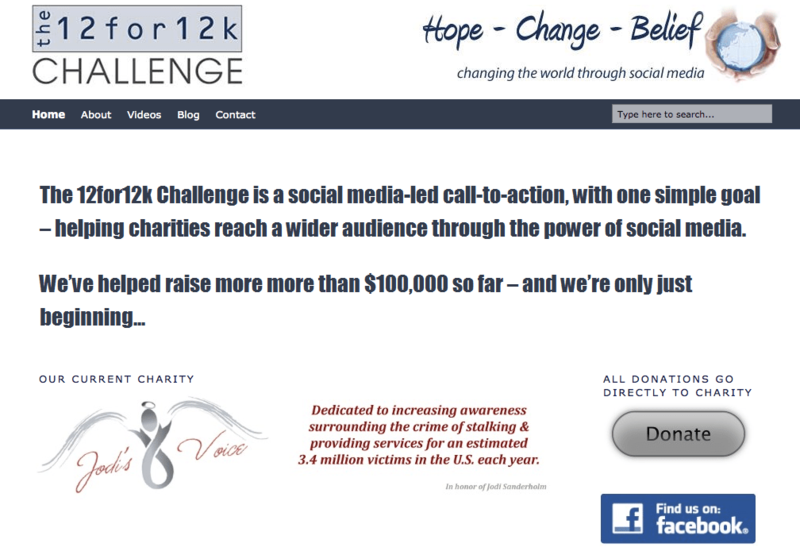 The goal of 12for12K was to support charitable causes that operated with no more than 10% administrative costs, are a registered charity, and accept donations via PayPal or credit card. Driven purely by the power of social media, including bloggers and social media users of all ages and gender getting behind the cause, 12for12K raised over $91,000 that year, and just over $100,000 overall in its 13 month existence. Angela Daffron launched Jodi’s Voice in 2010 after her long time friend, Jodi Sanderholm, was murdered by a man who stalked her for 10 years. The organization’s mission is to raise awareness about stalking and provide support to victims of stalking, as well as advise victims of online stalking. Jodi’s Voice is a movement to educate people about stalking and what resources are available when they become victims. The National Association of Eating Disorders (NEDA) was founded in 2001 when it merged with the American Anorexia Bulimia Association (AABA). Although much of its work to educate the public and provide assistance to combat eating disorders is done offline, the group uses its blog and social media presence powerfully. You may be aware that social media has been used to glorify eating disorders; NEDA is using it to stamp those horrible messages out and help people heal. The hyper local movement Save the Manatee Coastline was quite personal for me, as it effects the protected mangrove populated coastline just east of the historic fishing village where I live. Mangroves are protected in Florida because the groves are the breeding ground and habitat for shore birds and fish. When a developer requested permission to expand his proposed residential development to include a massive marina that would wipe out 60 acres of mangroves and dredge a channel for boats, many residents of Manatee County were alarmed. We created a change.org petition and a Facebook page to bring together the many groups and citizens against the development, and managed to pack the commission meeting with over 1000 attendees – the most in commission history. The developer’s request was defeated and the mangroves protected; I have no doubt that it would have been near impossible to mobilize our side so quickly without the help of social media. Susan Mueller Baranoff & Marjorie Clayman founded Blankies for Boston with a goal of making 1000 homemade blankets to give comfort to the victims of the Boston Marathon bombing back in April of this year. The campaign brought together crafters from all over the US to give handmade comfort to the people of Boston. Their Facebook Page is filled with gorgeous images of their blankets. This one really touched my heart because it’s about regular people helping regular people, communicating it all through social media channels. 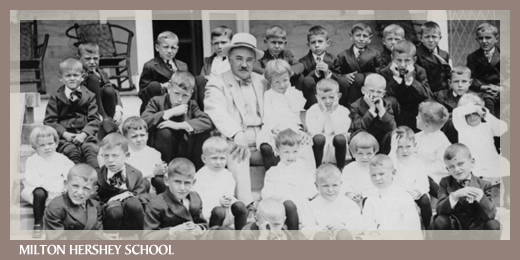 I attended Milton Hershey School, a residential school for disadvantaged children. We are a family of alumni; most of us do not have biological family members to turn to when things get tough. Last year a graduate of the school lost his son in a motorcycle accident and his house and all of his belongings to a fire within a one month period; his family was devastated. Using wepay.com and our social media channels, we brought together alumni of MHS from all eras and raised enough money to get the family back in housing and help defray some of the funeral costs. It was a very quiet and personal movement that is repeated endlessly on social media; sometimes it’s easy to overlook these acts of kindness, but they’re out there. This story was one of my favorite of the past few weeks; I found it flowing through my Facebook stream, often overwhelming with its gossip and negative stories. Four college students wander into an unlocked, unmanned store that was supposed to be locked. They get what they need and leave the exact amount, including tax, to pay for their purchases. Of course most people would do the same thing, and the students were a bit bewildered by all of the attention; it makes one think of all of the positive stories that don’t get told online. Upworthy is one of the bright spots of the social media sphere; it brings stories of positive people and ideas to all of its followers. This interview with Jason Alexander is touching because it reminds all of us that making other people feel good is one of the greatest things we can do. There is no better way to end this post than to ask you to take 18 minutes of your day to watch this powerful talk by Gopi Kallayil about how much more good we can do using technology and social media to do social good. We’d love to hear your stories of positive changes or thoughts brought about by social media. I am so happy to see this. How many bright and wonderful people out there trying to make a difference, create change and dialogue through positive change. It is human nature to delve into the darkness of life, but it is human consciousness that chooses to see and create good in the world. Thank you for the recognition of some of the uplifting things that are happening around us. Perhaps your commentary will be a pivot for someone to choose to see hope and happiness instead of distrust and darkness. Thank you. @Chris Sohar Well Chris, I think last weekend was a ‘pivot moment’ for me; I am by nature an optimistic person, but my many hours logged on social media brought me to a point of utter frustration. A few of my friends, especially @shellykramer , shook me out of it and reminded me that I CHOOSE what to wallow in. I think I may make it a regular feature – there are so many more stories to tell. Love seeing SMAC and Jodi’s Voice recognized here – two very important causes run pretty much by one person in each one. Truly inspired leadership. All great examples but i really liked the TEDx talk because of the examples of innovative uses of technology. Smartphones have often been criticized for harming communication but the video shows great examples of how smartphones foster communication and community. These are all great examples Amy. There are countless initiatives and one worth mentioning is cindywaitt and her venture following the movie, “Bully”: The Bully Project: http://www.thebullyproject.com/. This not only provides a venue for people to share their stories but also tools and resources to help. hessiej cindywaitt I think I’m going to do a once a month round up of great things being done with social media as a primary driver.